After my previous success at canoe building I couldn't wait to to get cracking with the next one. The main lesson I learnt from my previous experience was that a flatter bottom would be needed for a canoe with good stability on the water. 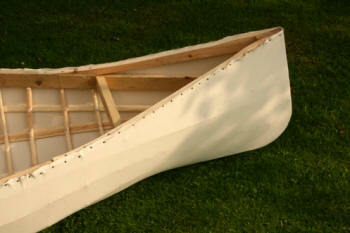 In this article I hope to show you the main steps towards creating a finished canoe. Hopefully there is enough detail for anyone to feel they can have a go at this project. 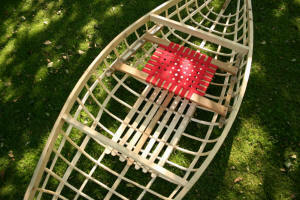 The design will vary according to the intended use of the canoe and the materials you have available. 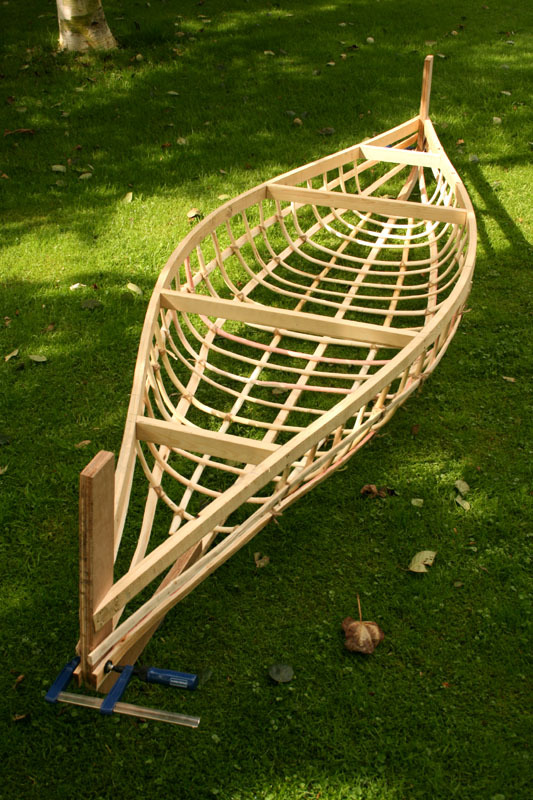 In this example I did not work to a plan, there is however a basic methodology which the canoe evolves from. For each gunnel I laminated two slats of wood together to make them 1 inch x 1.5 inch each. They could easily have been made from a single piece of wood each, however I found that by making them from two pieces and laminating them I could more easily create a slightly fancy shape. 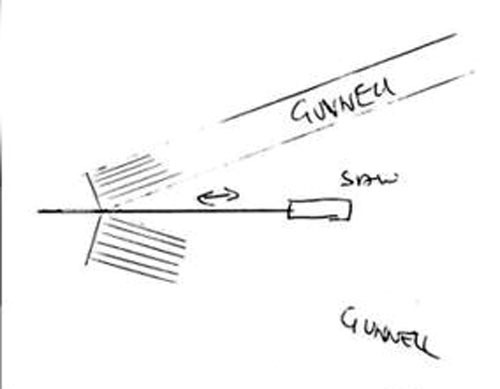 It's quite subtle to see but the space between both gunnels gets narrower sooner towards the ends. 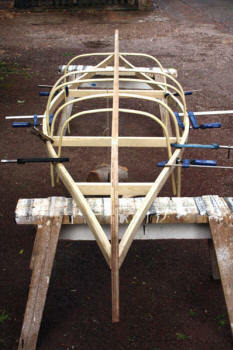 While the glue is still liquid, the gunnels are bent into shape, clamped and left to set. A temporary thwart at the centre holds the shape open. 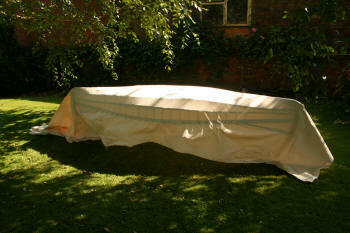 The next job was to make the ends of the gunnels fit flush together. 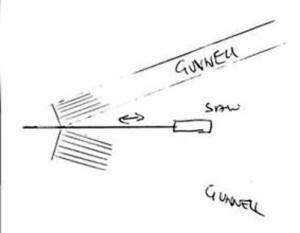 I did this by using various straps and clamps to hold the gunnel ends together whilst I used a hand saw to to shape the ends to the right angle as shown in the diagram. 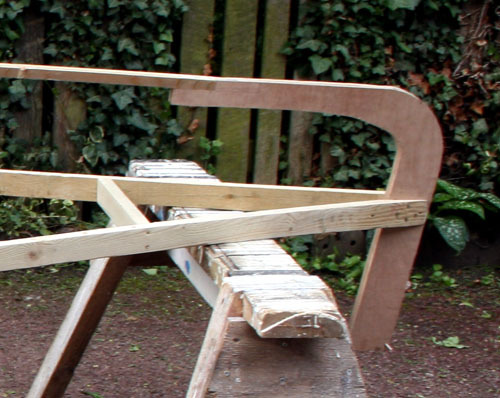 If you push the saw between the two ends repeatedly you eventually get flat surfaces. To begin with, because there is quite a bit of wood to remove you can estimate the angle and cut a reasonable amount of wood straight off. Time to fit the thwarts... (It's not quite time to fix the ends together yet) They need to be strong as they help to Keep the boat in shape. Make sure they are perfectly aligned before fixing into place. 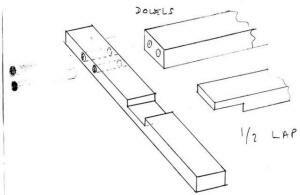 Rather than using mortise and tenon joints I felt wood screws would be better, this would save chiselling holes through Gunnels. 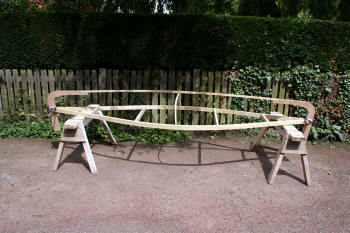 I now needed to drill holes along the undersides of the gunnels into which the ribs would later be fitted. I used a drill piece 3/4" wide (1 cm) and made a hole every 4 inches (10cm). 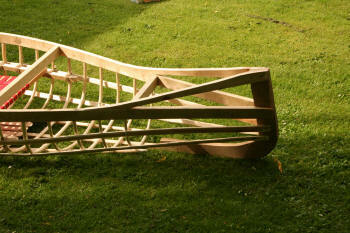 Now to make the stem pieces for the ends of the canoe... I used 0.5" (12mm) exterior ply wood to make these. I needed them to be 1" thick so for each I cut two identical pieces with a jigsaw and stuck them together. Use external wood glue. Before fitting them it's a good idea to give them a coat of external grade varnish such as yacht varnish, this will ensure the laminations of plywood do not separate if they become wet. 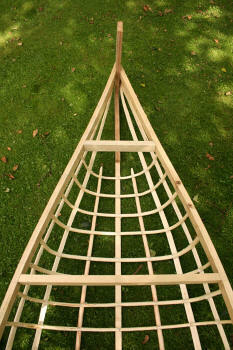 For the following work propping up either end of the canoe on trestles will make life so much easier. 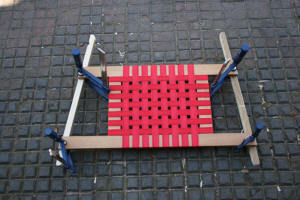 If you don't have trestles consider making or buying some. I made the first rib to the correct depth and fitted it at the centre of the canoe. (Fitting ribs is described later. 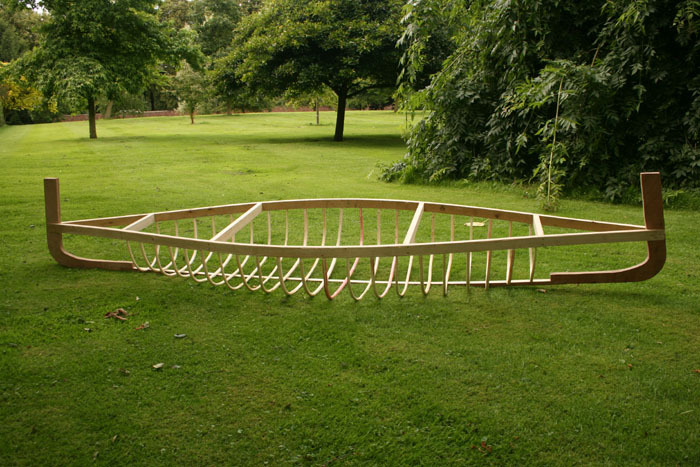 I wanted the canoe to be around 12 inches (30cm) deep at the centre) This first rib will hold the keel batten at the correct height while we work things out. 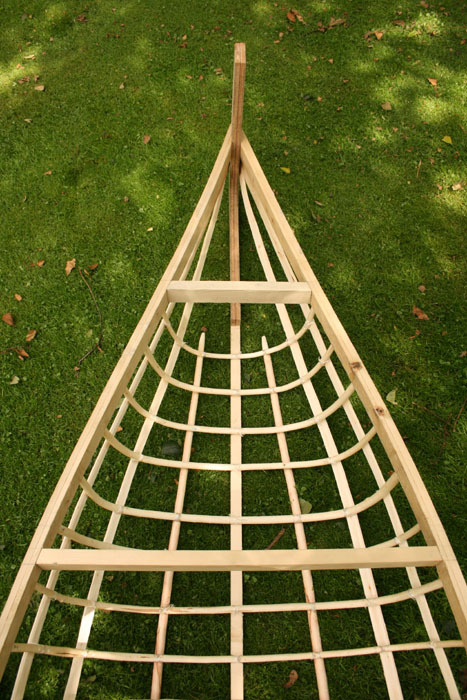 The keel batten is like the back bone which is secured between the two stem pieces along the bottom of the canoe, it should be quite strong and perfectly straight (I used 1" x 1" wood). The stem pieces are clamped in place between the ends of the gunnels while the keel batten is sized up and cut to length. When I was happy with the whole assembly and it was perfectly aligned the pieces could be permanently fixed together with screws. 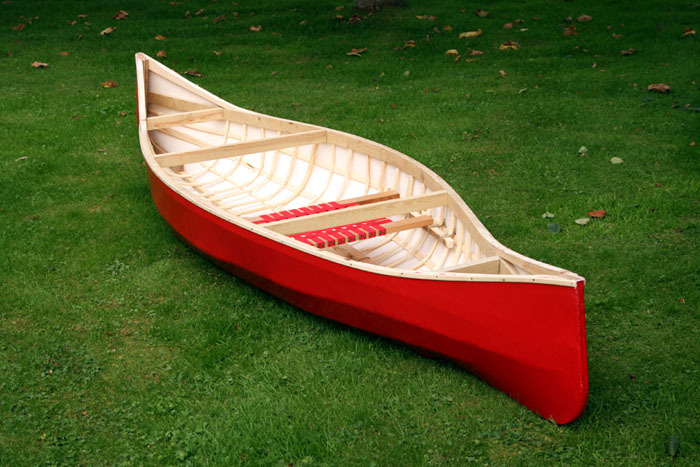 Note: Making the centre of the canoe slightly deeper than the ends will enable the canoe to turn more easily in the water. This is called 'rocker'. You can see in this picture how a piece of the stem piece was cut out to accommodate the end of the keel batten. The tops of the stem pieces are left long so that 'Indian ends' can later be made. These will rise up from the gunnels towards the ends creating an iconic shape. 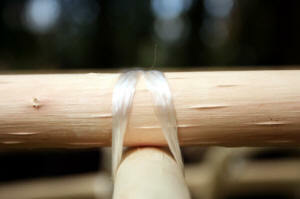 Gradually coax the wood into shape bending it between your hands or around your knee. 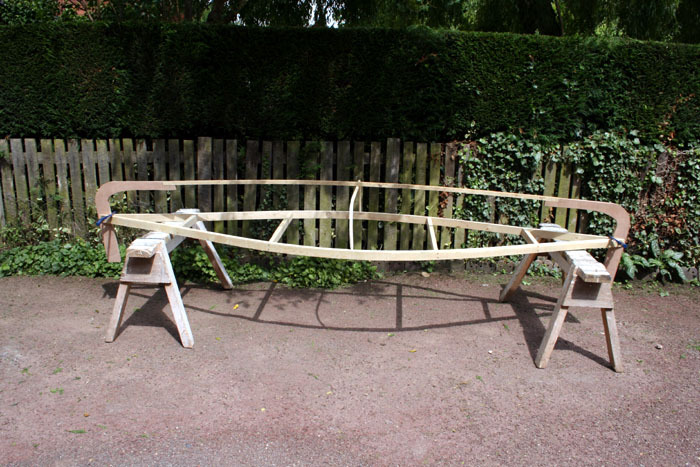 Make two bends on each rib the correct distance apart, leaving the centre portion straight and quite flat. 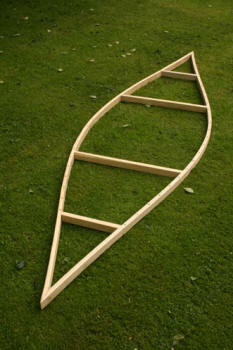 This will give the canoe a flatter bottom which means more stability. 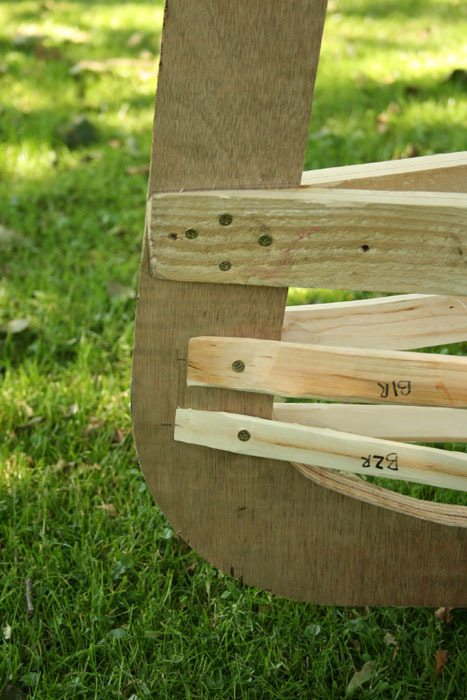 After bending each rib into shape, clamp them temporarily in place, If the centre portion is bowing out too much you can hang a weight from it to pull it down flatter. Leave the wood clamped in place until it has completely dried, the wood will have then shrunk a little and have kept it's new shape. When the ribs are totally dry, any excess length can be cut from the ends (remembering to leave some wood to fix into the gunnels.) Fit them by carving down the ends slightly with a knife until they fit snugly into their holes in the gunnels. When I was happy with how all the ribs looked I glue them into place. The next job was to make the Longitudinals. (the canoe was really taking shape by now!) I made the longitudinals from Willow wood too. 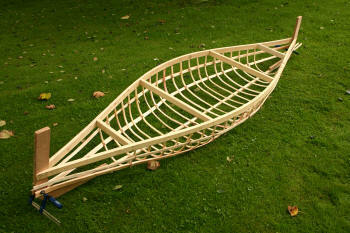 I used long lengths of straight willow that I carved flat. I clamped the wood to the ribs and stems so that they take their new shape. When the wood dries they will not spring back straight again. I made 6 longitudinals in total. 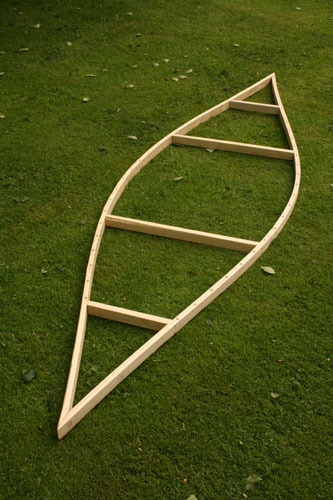 The bottom two longitudinals are left round and they end about 3" past the last ribs. For then next job you need patience... The ribs and Longitudinals need to be tied tightly together at the points where they cross. 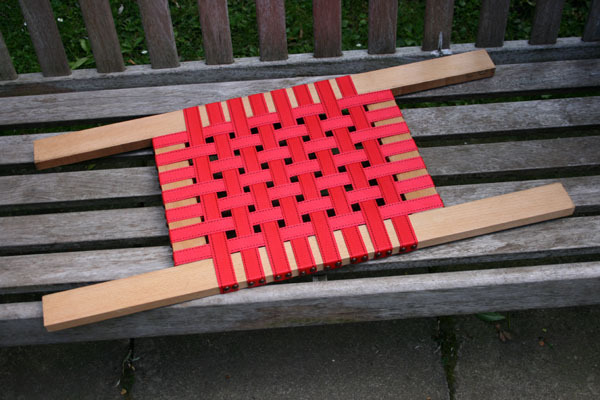 I recommend using waxed artificial sinew because it is not bulky. Average string would create a bump which would show up on the outside of the canoe when it's covered. Detail showing rib tied to longitudinal. Make knots on the inside. The four longitudinals that extend to the stem pieces are screwed in place. 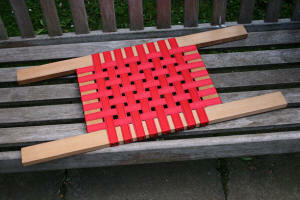 I also carved some decking slats and tied them at the place where I would be sitting. This prevents your feet coming into contact with the ribs and the canvas. The structure will now feel very strong now that everything is tied. 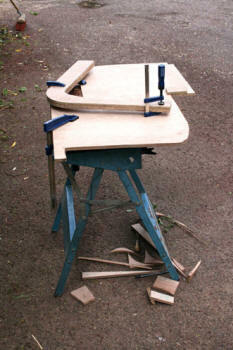 I now began to work on the seat. 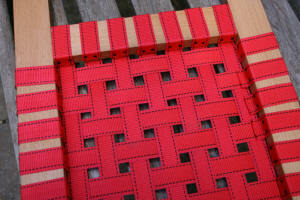 I had some nice strong Beech wood and some webbing from some ratchets; perfect. 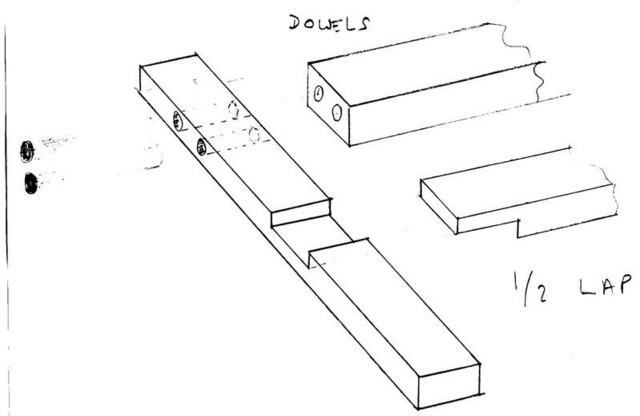 You can use either of these kinds of joints to join the wood together. This is the finished seat. the way it is constructed if easy to see from the pictures. It is tacked on the underneath with 'blue tacks'. If the ends of the seat were each attached to a single rib this would put considerable strain on these ribs. 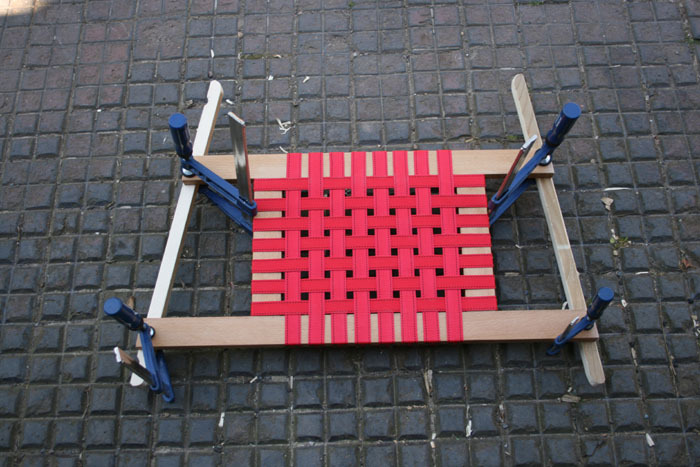 To overcome this problem the seat is attached to a batten of wood on each side. 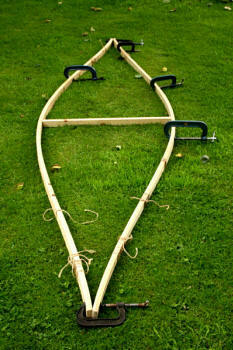 Each batten is then tied to six ribs so that your weight will be distributed better. 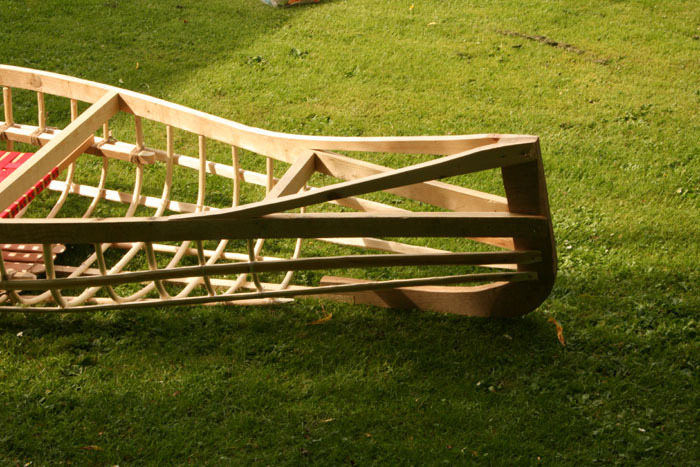 The ends of the seat are cut to the exact length and angle to fit the canoe. The front edge of the seat should be located at the centre of the canoe so that your weight is slightly to the back. The seat is attached to dowel pegs that are glued into the the edge battens but not the seat so that the seat can be removed. 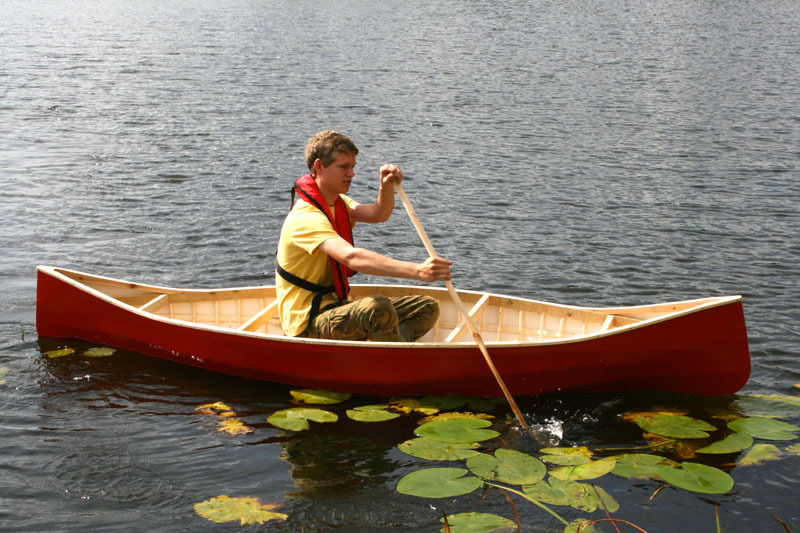 You will have the choice to kneel or sit in your canoe this way. 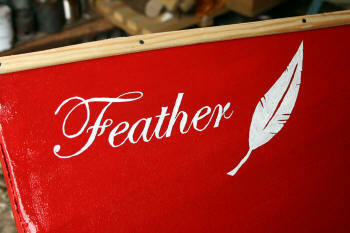 The last thing I did before attaching the canvas was to make those Indian style ends. I simply used some straight sections of wood for these and cut a curve in the top edge. I then had to cut the correct angles on either end so that they connect to the top of the stem and gunnels correctly. They were then permanently attached with screws. Make sure you buy canvas with plenty of extra length and width. Its better to have too much than not enough. "You will have to split the canvas to do the stems. 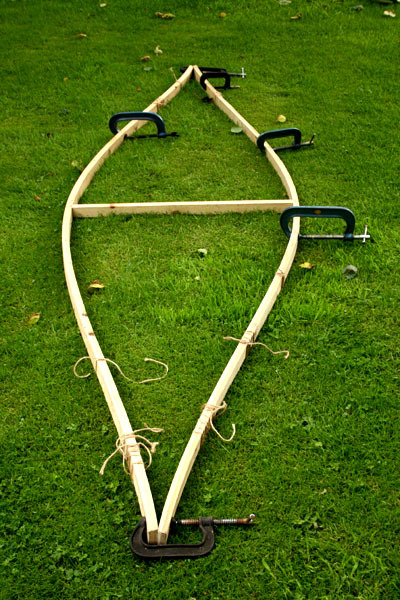 Put that beautiful canoe frame upside down on some trestles, preferably tie the frame to the trestle so it does not move too much. Fold your canvas along the length to give yourself a centreline you can mark that with a marker of some description, drape your canvas over the whole thing and put your centreline on the keel, you can put a few tacks to hold the canvas in place along the keel, start one end with a couple of tacks then go to the other end, stretch the canvas and tack, then put a few tacks every foot or so. Then from the middle of one side you can pull the canvas tight and tack it along the gunnel, start in the middle, level with a tack on the keel, so you can stretch the canvas without distorting it too much: like that: tack 1 then 2 then 3 then 4 then 5, 1 being the middle. Make sense? Then do the other side in similar fashion and so on along the whole length. You probably will need to adjust by removing some tacks every so often to pull creases out You can cut the canvas along the gunnells ( don't split the ends yet) but give yourself enough of it to be able to grip and pull tight. When its tacked along both sides, say every 4" you can start doing the ends. By then you should see how to finish the stems, cut the canvas , giving yourself enough to pull and tack one side along the stem, then the other side. Be careful that you may have problems with splitting the ply, try to stagger the tacks so they don't all end up in the middle layer of the ply. 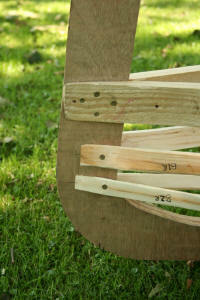 It may be worth your while to put a few screws through the tickess of the ply to prevent it from splitting. 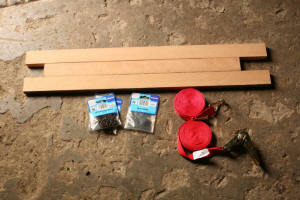 As they will have to stay there try using brass screws so they won't rust." All that was left to do was to paint the canvas and fit a strip of wooden trim along the edge (known as beading) to give a nice finish to the edge. 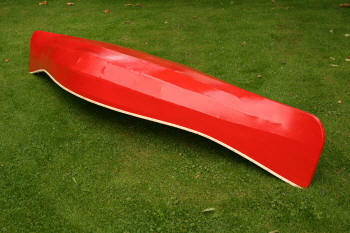 You should give the canoe two coats of undercoat and two coats of over coat. Just use enough paint to fill the weave of the canvas. Use paint suitable for external use on wood. 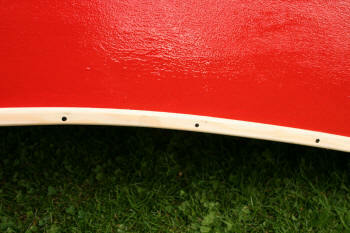 Between coats I gave the canoe a light sanding with very fine sand paper. 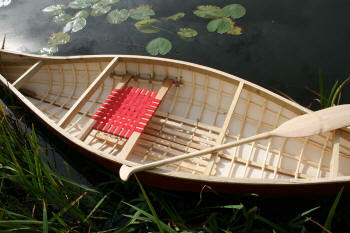 The last job was to fit the wooden beading along the edge of the canoe to cover up the edge of the canvas. 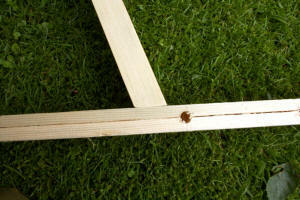 Use galvanised nails to attach this otherwise you may get rust stains in the future. 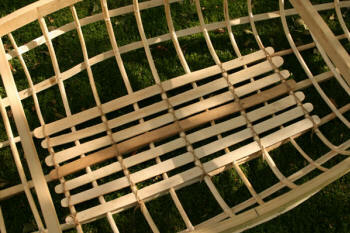 With a bit of persuasion and help from some clamps the beading bent to the shape of the Indian style ends. 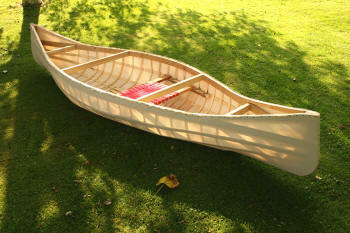 Canoe finished! I can't tell you how satisfying it is to step into a hand crafted canoe you have made with your own hands, and then paddle it away... It's a truly beautiful feeling.